Daeron and 2 Guests are viewing this topic. I used some space between , (comma) and $rgb() to make the parts better visible ('kay, not really neccessary), but more then that at $set_style() where the definitions are longer due to $if()- and $strcmp()-statements. Loading a playlist (.fpl) via foobar2000 or a file manager (File Explorer, Total Commander), the playlist title always is 'New Playlist'. Only when loading a playlist via ColumnsUI's playlist tabs panel, the correct playlist name is shown. 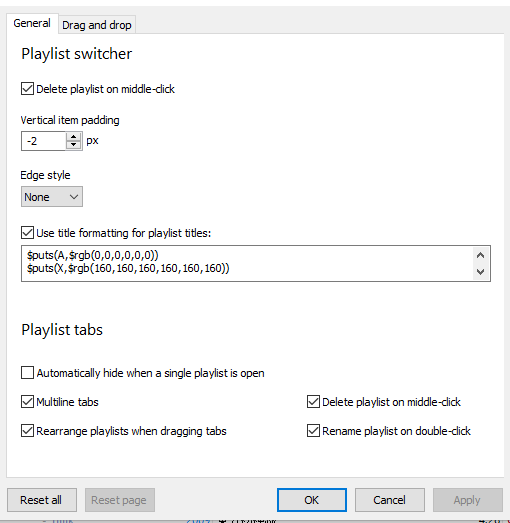 I tried placing different variables into the playlist title formatting field of the 'Playlist switcher' config dialog, tried the same with 'generate playlist names...' in the 'Drag and drop' dialog, but all to no avail. Is there a way to accomplish this? For double-clicking FPL files in Windows Explorer, the settings in Shell Integration in foobar2000 preferences should apply. The choice there would seem to be to always send opened files to a particular named playlist, or always send them to the active playlist. All the 'Load playlist...' commands I could find in foobar2000 used the file name of the FPL file for the playlist name. Generally, spaces matter in title formatting. Hence, they would be included in the variable name or value as far as $set_global() goes. The same is true of $put(), $puts() and $get(). At one point there was an alternative title formatting syntax available (activated using '#script 1') which had quoted strings, but it was then removed. I love foobar and use it for many years. However, it was always the default UI for me, I am new to columnsUI and found that the new version works great. 1) I cannot find out how to figure out a rating system within the new playlist. I would like to have empty stars or boxes in there that fill up when I rate a track. 5 items altogether would be ideal. I researched a lot on the web but couldn't so far find a piece of code that works. I have upgraded from version 0.5.1 to 1.0.0. I have noticed that the height of the column titles in playlist view has increased. The text size has remained the same. Can I somehow restore the old height without modifying the font? I guess you were using Columns playlist under 0.5.1? As far as I can see, Columns playlist was using font height + 5 pixels while the current playlist view is using font height + 7 pixels. In other words, I make the difference to be 2 pixels. Is that what you are seeing? 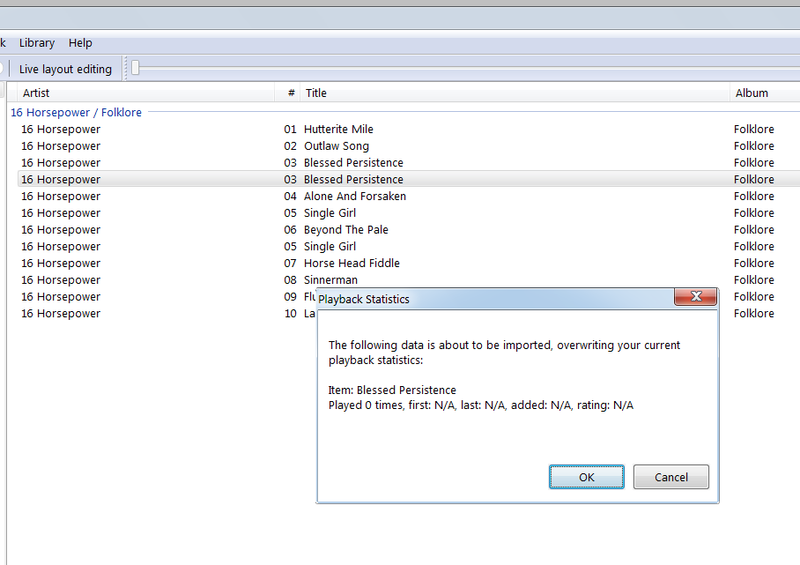 Yes, i was using Columns playlist under 0.5.1. The height difference is indeed 2 pixels. Thank you for your reply. It causes an [INVALID $IF SYNTAX] error to appear wherever I'm checking that variable. Am I missing something patently obvious? That works as expected here. For example, with that in my global variables script, I can put $if($get_global(is_single),true,false) in a column's display script and it outputs true for tracks without a track number, and false for tracks with a track number. Do you have an example of the code that is attempting to use the variable but doesn't work? musicmusic, you're absolutely right - I woke up in the middle of the night and realized that I only saw the error when i was using that comparison because it was working; once I took it out I couldn't see anything at all. I found the error, there was an $if in another section where there should've been an $if3. Copying and pasting tracks and statistics seem like unrelated operations so I'm not sure how they could get mixed up like that. Perhaps you could post some screenshots or a video to demonstrate? Does it happen with Default UI? I'm guessing the connection is the common "control + v" command that pastes both statistics and a track into a playlists without erasing the previous information(?). Ctrl+shift+c copies legacy copy info (and I'm guessing copies track) and ctrl+c copies statistics. Ctrl+c and ctrl+v are custom keyboard shortcuts. About the screenshot, I can but I don't know how it would help, it would be a duplicated track in a playlists and a confirmation message about replacing statistics. I can't explain it better, legacy copy command is "%artist% [%performer% ]%title%" but it shouldn't matter. It used to work in a normal way so if you can't replicate it's no problem of course. It does not happen in DUI, pasting legacy copy command results in a text, literally "%artist% [%performer% ]%title%"
What I mean is that if I copy a track using 'Copy', 'Playback Statistics/Paste statistics' is greyed out. If I copy statistics using 'Copy statistics', 'Paste' is not present in the context menu. I also have no idea why the 'Copy command' title formatting string is considered legacy. Even in the Default UI, it is used if I copy a track and paste it in Notepad. If you can provide exact instructions on how to reproduce it from a portable installation, I could have another go at reproducing it. 5. "Preferences - advanced - display - legacy... - copy command" is "y %artist% [%performer% ]%title%"
Thanks, I managed to reproduce it. 1. 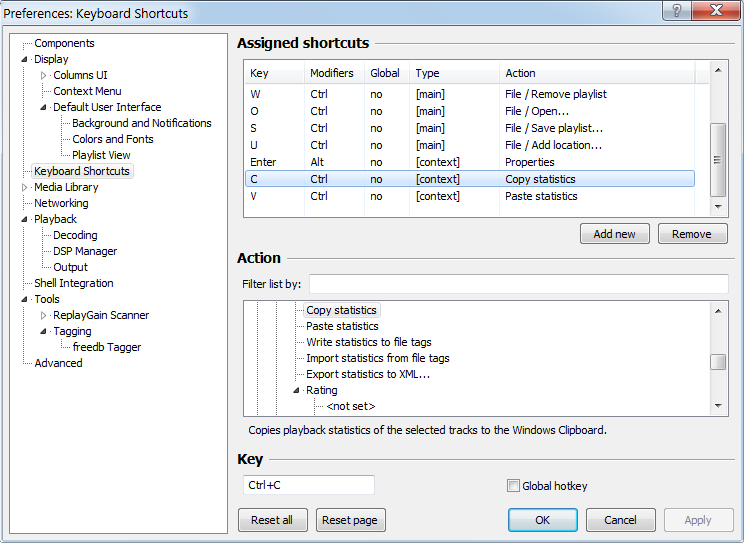 Copy statistics claims to use the Windows clipboard, but does not overwrite what was in the clipboard. You can even copy some text in Notepad, copy statistics, and then paste that text again. 2. Both paste commands are triggered in Columns UI. It looks like the logic to prevent that fails because Paste statistics opens a modal dialog box. I'll fix this. - Cool. I can add that it's a recent change. Is Columns UI still available to download somewhere? I hope musicmusic doesn't mind sharing it outside his domain. I'll attach the 1.0.0 version here while his site is inaccessible. Edit: yuo.be is back up. Attachment removed. Apologies, it should accessible again now. How do you remove the Live Layout Editing button?